A Los Pinos Fire Protection District firefighter wets vegetation as flames from the 217 Fire approach a home southeast of Durango on Friday. Karola Hanks, fire marshal with the Durango Fire Protection District, on Sunday reported the fire has been fully contained. The wildland fire eight miles south of Durango has been 100 percent contained as of Sunday evening, said Karola Hanks, fire marshal with the Durango Fire Protection District. 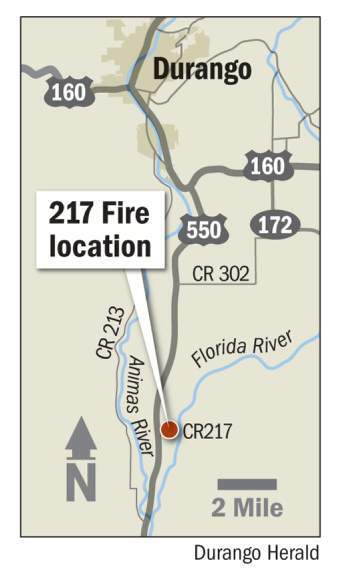 Hanks said the 217 Fire, started about 2:30 p.m. Friday on County Road 217, east of U.S. Highway 550. 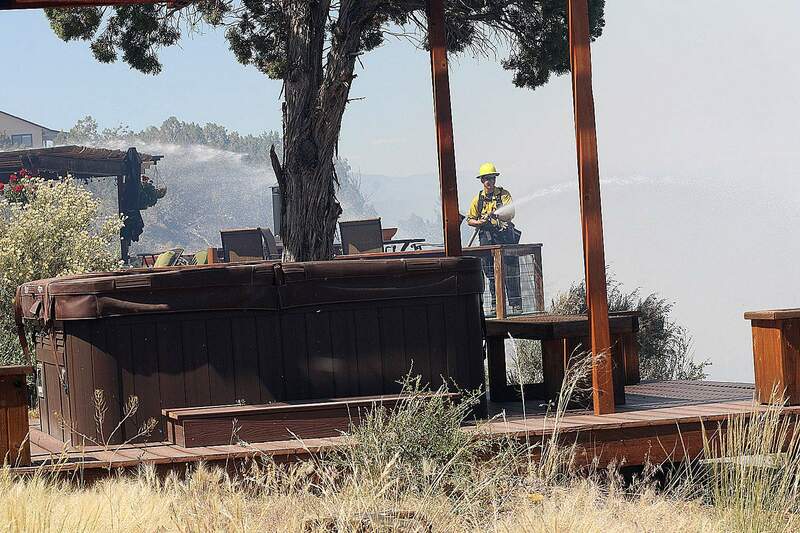 The fire had consumed 30-acres of piñon and juniper, but it posed no risk to structures. Although high temperatures continued to beat down on Durango on Sunday, Hanks said low winds were a key factor in limiting the fire’s footprint. The fire started as a result of a local property owner’s planned burn, which went out of control. Hanks said the fire department will investigate for origin and cause, and the La Plata Sheriff’s Office will work on the legal aspects of the fire. Because the fire was to assist with agricultural production, it required no permit. However, Hanks said a discussion between state, county and local agencies will determine who is responsible for the fire, and if any penalties are warranted. Hanks said the fire line around the burn zone was completed Sunday morning, and a crew of about 15 from Los Pinos and Durango-area fire protection districts spent the day monitoring the fire and cooling off hot spots. Hanks said crews were released 6 p.m. Sunday, and will check the fire periodically over the next few days. The 20-person hand crew from Juniper Valley that was working the 217 Fire has been reassigned as of Sunday morning to assist crews on the Sage Hen Fire, north of McPhee Reservoir. Hanks asked residents adjacent to the fire to report any smoke or fire. In Montezuma County, a wildfire that erupted Saturday afternoon in the Sage Hen area of McPhee Reservoir, west of Dolores, was reported 80 percent contained at 7:30 p.m. Sunday, according to a U.S. Forest Service official. Firefighters on Sunday mopped up hot spots and cut down brush the day after the 150-acre fire started. The fire started on a private, grassy field near roads X and 25 at McPhee Reservoir, said Montezuma County Emergency Manager Paul Hollar. It then moved north and east onto U.S. Forest Service land, burning through piñon and juniper. Officials set up a staging area north of McPhee Dam. Late Saturday, the fire was estimated at 150 acres, said Ann Bond, public affairs specialist for the U.S. Forest Service. No immediate structures were in danger, and no evacuations were ordered. The fire’s pace slowed Saturday night, Hollar said. Three fire engines were on scene through the night Saturday, and there was no fire growth overnight, said a Forest Service official, who asked not to be named. An air tanker and a helicopter were in use Saturday night, but no aircraft had been used Sunday morning, he said. Two Type 2 firefighting crews were on scene Sunday morning for a total of 40 to 50 people, the official said. Wind from the southwest was expected, but no structures were in the fire’s way, he said. Firefighters for the Grand Mesa, Uncompahgre and Gunnison National Forests continued to manage the Pitch and Kelso fires on Sunday. A large column of smoke could be seen looking south from Grand Junction, Delta and Montrose. This column was the result of a prescribed burn on the Manti-La Sal National Forest in Utah. The Pitch Fire is about 20 miles southwest of Grand Junction, on the Uncompahgre Plateau. The Skyway Fire Module, the Veterans Fire Crew and firefighters from Collbran Job corps continued their work to strengthen and widen perimeter lines by burning unburned fuels, particularly on the north side of the fire, between the containment boundary and the active fire. The fire had grown to about 75 acres. The Journal contributed to this report. jromeo@durangoherald.comThis story has been updated to correct that a red flag warning was not in effect on Friday, the day the 217 Fire started.